Winter is a great time to visit Cornwall if you are looking for a relaxing break, without the crowds. If you like spending time by the coast, this is a perfect opportunity to wrap up warm and hit the beach. In contrast to the summer months, it is not uncommon to have certain beaches all to yourself at this time of year. Breathe in the fresh sea air and take in the sounds of the waves. Warm up afterwards with a hot chocolate in one of the county’s many cafes, or enjoy a hearty pub lunch. Why not combine a beach walk with a stint along the southwest coastal path? There are some great stretches that are particularly good to do during winter. You will be rewarded with stunning views of the coastline. Fowey is a great starting point for a number of walks, including a short walk which takes in St. Catherine’s Castle. If it is raining outside, indoor exploring might be more the ticket. 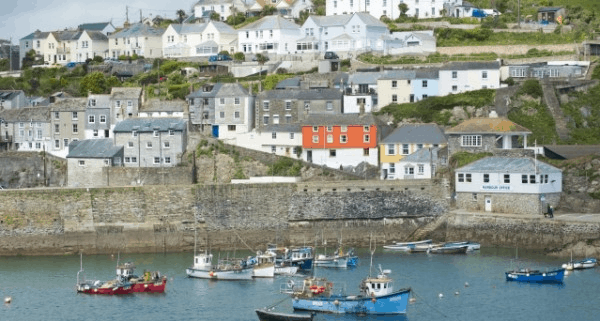 The town of Fowey has a selection of independent shops and small art galleries to browse, and the coastal villages of Mevagissey, Looe, Polperro and Charlestown are a short car journey away. Head inland and the town of Lostwithiel is just a fifteen minute drive from Fowey. Spend a couple of hours antiquing before heading to the Duchy of Cornwall Nursery – home to an excellent cafe, and a paradise for any keen gardener. Views of Restormel Castle can be enjoyed from the cafe. Other heritage sites within a short driving distance include Lanhydrock House – the National Trust site’s grounds include beautiful landscaped gardens, woodland walks and trails for cycling. Bikes can be hired close to the car park entrance. For those happy to travel a little further afield, National Trust and English Heritage have a number of fascinating sites to visit throughout the county, that are open year round.